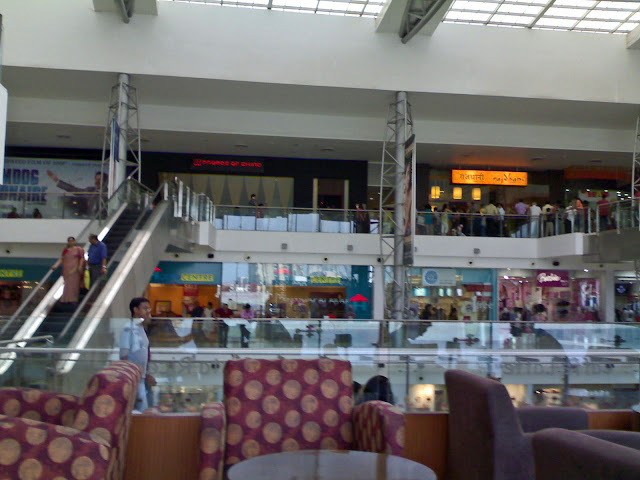 These are photographs of interiors of four Mumbai malls. Nowadays they have become quite strict and guards come running if you whip out a camera inside of a mall. A foreign guest who was with me once felt this was a sad situation when genuine family people could not take pictures of themselves in malls. Quite futile and stupid because those who want to take pictures for nefarious purposes can easily do it surreptitiously with a mobile phone camera! You cannot have guards watching every single person in the crowd. Not in a shopping center. 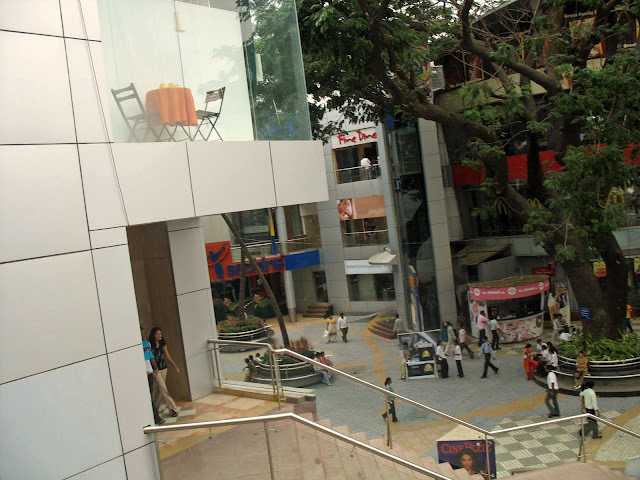 The first few images are of a very large mall in Mulund, a suburb of Mumbai. 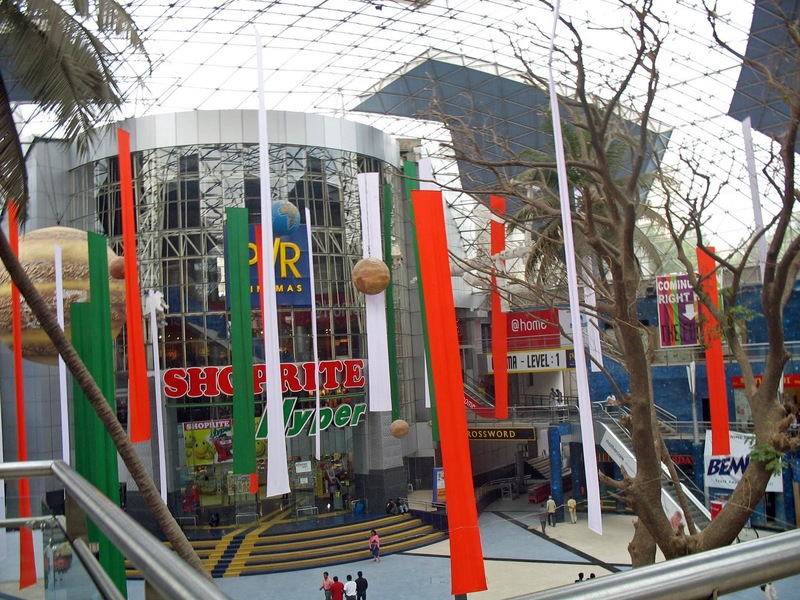 This was one of the first large malls in India. 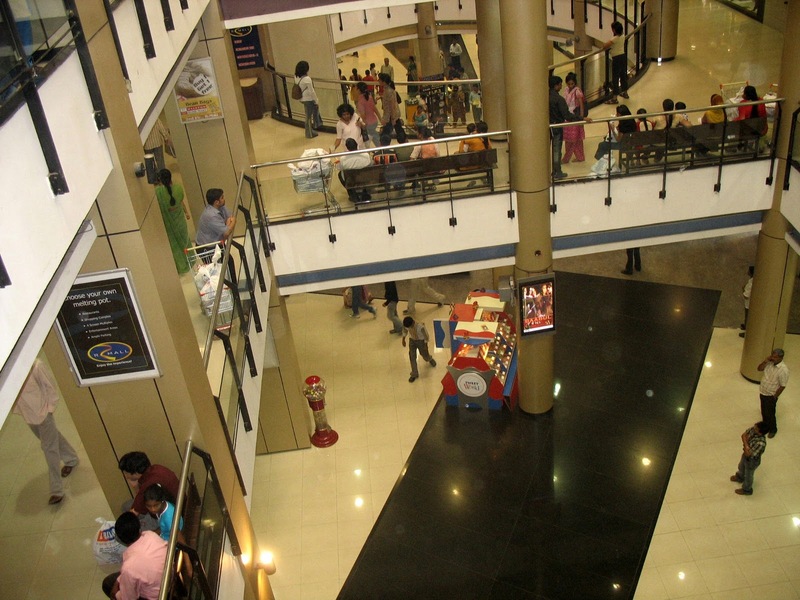 It has a multiplex cinema hall as well as stores with big brands. These pictures were taken when the mall was just opened, some years ago. At that time no one objected when I took these shots. Later for some silly reason photographs (even of ourselves in the mall) was forbidden. Talk about the stupidity of the mall managements. The picture below of a supermarket called Shoprite, a South African chain. However they have pulled out from India due to the high realty prices and now the space is taken over by Big Bazaar and is named Foodrite. PVR has its multiplex cinema hall here with about 7 screens. 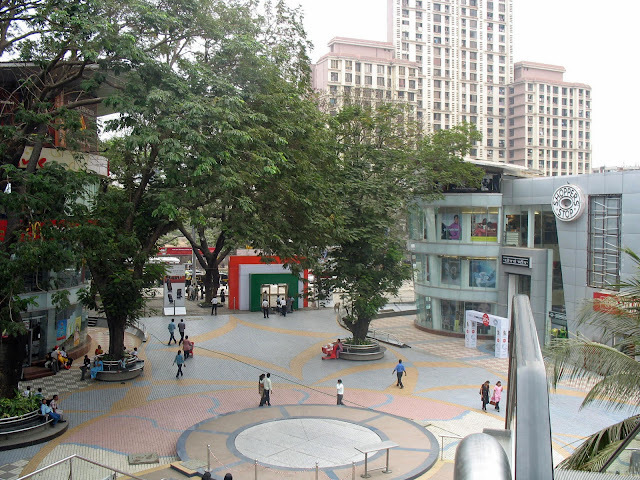 At one time Nirmal was a great place as it was spacious. Unfortunately it is no longer so. The empty spaces inbetween have now been leased to companies for their advertising and promotion, and every available space is now packed. The photo below is just one example. It's an ad gimmick by the Gillette company, putting up a stall and getting attractive girls to shave random people. Inside the glass shed you can see the face of a man reclining on a chair (top left hand corner of the shed) and a girl's dark head bent over his lathered face. Naturally, there were gawkers galore, including us! This is a picture of a part of R-Mall, again a popular mall in Mulund. 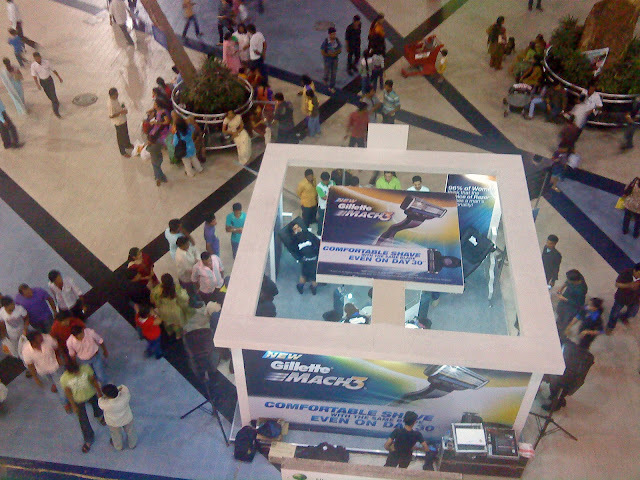 The pictures below are that of Inorbit Mall in Malad, a very popular mall. It has a good food court and if I get a good photo of that will update this post. This photo is slightly blurred because the lighting was poor, but it was taken at a different time. 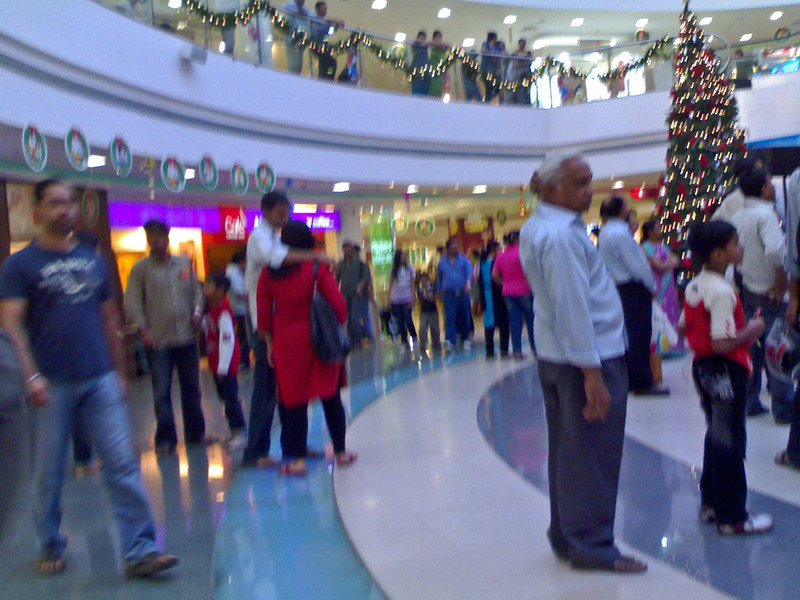 I am not sure which mall it is in, but it was Christmas and you can see a tree in the top right hand corner. I think it was Inorbit.